What some believed impossible has come to pass: a quiet week in Trumpland! When the biggest visitors to DC over the past 7 days are the Italian prime minister and the Easter Bunny, things are definitely pretty chill. But "chill" doesn't necessarily mean "boring." After all, this is Trumpland — not some island in the Pacific. Meme-ster Bunny: Speaking of the Easter Bunny, his visit to the White House this week was one of the high points of the week for the Internet. (It only could have been better if Sean Spicer had donned the suit again.) 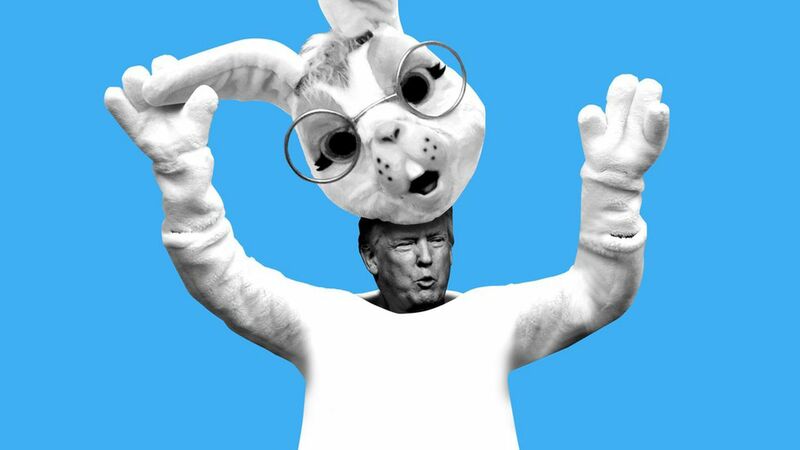 But the absolutely terrifying bespectacled bunny's appearance on the White House balcony with Trump, Melania, and Barron led to a meme onslaught. There were Hunger Games comparisons, True Detective references, and Chris Christie jokes. It was good to hear laughter again in Trumpland! Pat on the back: You know things are a little quiet in Washington when POTUS turns to Twitter. And he did so a bunch this week — lashing out about Georgia's special election, the French presidential election, and his first 100 days — but he also got to hit one of his favorite targets, the "failing" New York Times. The Gray Lady's sports section had the misfortune of accidentally misrepresenting the number of New England Patriots players who showed up to the White House after winning the Super Bowl earlier this year. And Trump ate it up. How could he not? They might be the only football team he knows. Check between the couch cushions: …because POTUS saved that move for South Korea after "a glitch-filled sequence" led to the Pentagon and the White House misplacing an entire aircraft carrier group that was supposed to be acting as a North Korean deterrent for a few days. And somehow, people only found out when the Navy posted a photo of the aircraft carrier a few thousand miles away from the Korean Peninsula. A lot of South Koreans were pretty peeved about the whole thing. Moral of the story: it's easy to get lost in Trumpland. Back from the undead: Citizens of Trumpland, beware! Zombie Trumpcare is back! Well, maybe. No one really knows. With the government already facing a shutdown at the end of next week, the White House wanted to make a move to prioritize Obamacare repeal again once Congress gets back from its recess. News broke that there'd be a vote on Wednesday, but then more news broke that there wasn't actually a bill. The best we can offer: stay tuned. You had a break this week, Trumpland, but next week is sure to be a wild legislative ride!